Location: Indo-Tibet Highway Kunzum Pass Rohtang Pass Tabo Dhankar Kee Komic Lhalung Dhankar Lake Chandertal Parikrama. A tour that encapsulates the best of Himalayan experiences in a span of 8 days. From foothills to high mountains, from pine forests to cold desert – this tour takes you through the heart of Kinnaur district before continuing to the highlands of Spiti Valley. 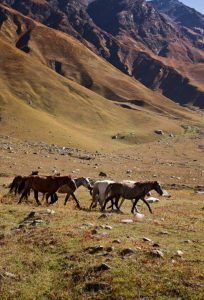 Along the journey you will witness – high passes, dangerous roads, deep gorges, snow mountains, pine forests, vast riverbeds, high altitude villages and the most amazing people. 5. Enjoyable short treks – Dhankar Lake and Chandratal Parikrama. We pick you up bus stand at Shimla and so our trip begins. The drive takes you over the hills of the Shimla district through the towns of Kufri and Narkanda. After the initial dash over the hills, the road descends down to the Sutlej valley as we continue to the town of Rampur on the southern bank. The roads are carved on vertical rock faces at several locations giving itself a distinct identity. This road is popularly known as Indo-Tibet Highway. You’ll be welcomed by several hydroelectric power projects as you enter Kinnaur district, the major one at Karcham where a dam is built at the confluence of Baspa and Sutlej rivers. From Karcham we cross over the bridge and enter Baspa Valley to head towards Sangla, the overnight halt. We take you to the last village of India before Tibet in this region, Chitkul, an hour’s drive through the Pine forests and boulder fields on the northern bank of river Baspa. We take short walks in the village to the Mata Mandir, and towards the ITBP camp. After this we retrace the roads back to Karcham Dam and move towards Recong Peo on the Indo-Tibet Highway. Kalpa is a little village above the town of Recong Peo, it offers one of the most magnificent views of snowcapped peaks called the Kinner Kailash range, winter abode of Lord Shiva. The mountain is deeply worshipped by the locals. Every year in the month of August several pilgrims scale the peak of Kinner Kailash to worship a 70ft rock which stands out from the rest. Kalpa is a great place to see the entire range. Today is the day where we enter the Spiti Valley. The road from Kalpa initially descends to the Indo-Tibet Highway and continues on the left bank of Sutlej till Khab, the confluence of Spiti and Sutlej. We leave Sutlej behind and continue upstream of Spiti. Suddenly you can see the landscape has transformed with barren mountains all around. After an hour climb we reach Nako, another little village situated at an altitude of 3800m. The main attraction of this village is the artificial lake, which in the late spring is a sight to behold with pink flowers bloom all around the lake. After a brief stop at the lake we descend down to the river bed and continue upstream of Spiti crossing several villages – Chango, Shalkar, Sumdo, Hurling; before we enter the town of Tabo. Chos Khor Gompa is a 1020 year monastery located in the quaint village of Tabo. The monastery is one of the most ornately decorated depicting the life of the Buddha Pantheon covering its entire walls. You can spend enough time here talking to the monks trying to understand what a thangka painting is. Spend your day relaxing in the fields of Tabo or hike up to the caves, the monks used to meditate. Overnight stay at Tabo. Today we take the road to Kaza till we reach Sichling village, from here the road winds up to the Dhangkar monastery, which was once the capital of Spiti, under King’s rule. Dhang means cliff and kar means fort, the fort situated on the edge of a cliff. Dhangkar Gompa or monastery is one of the architectural master pieces of the Buddhist yore. Built 800 years ago this is one of the endangered archaeological sites in the world. Experience the old world feeling of the Dhangkar monastery. An hour and half hike takes you the beautiful Dhankar lake, relax and click as many photos on the shores of this beautiful lake before heading back to the village. From Dhangkar we drive towards one of the little know villages of Spiti, Lhalung. With Snow capped peaks in the background and the cultivation fields built on the slope of the mountain Lhalung is a photographer’s charm. Golden Temple or the Serkhong Gompa is another 1020 year old monastery adorning this little village. Drive to Pin Valley – a tributary of the Spiti river, ‘Pin’ originates deep in the Trans Himalayan mountains leading to one of the ancient trade routes and popular trek of Bhaba Pass. It is also home to the magnificent Snow Leopard and several Trans Himalayan animals and rare birds protected under the National Parks of India. You’ll drive through this beautiful valley up to last village of Mudh. After trying some local homemade pizzas for lunch, you will retrace the roads back to Spiti and continue to Kaza – the administrative headquarters of Spiti. Explore the local market in Kaza and go for an evening walk amidst the fields of Kaza. High on Himalayas is the theme of the day. We leave Kaza and immediately gain altitude as we head towards the village of Komic – the highest village in the world with a motorable road at a height of 4580m. Tangyud Gompa (Monastery) is the jewel of the place. The old and new monastery shows the devout Buddhist beliefs of the locals. We retrace the path towards Hikkim, situated at 4440m this village boasts the presence of Highest Post Office in the World. Send postcards to your family and friends from here. The road continuously meanders above 4400m till you reach the village of Langza, with the Snow Capped peaks jutting out in front of you in every corner leaving you breathless with its sheer magnitude. Our overnight stay is at Langza, the most scenic village of Spiti, situated under the shadows of 6303m peak called Mt. Chau Chau Khang Nilda and adorned by the large statue of Buddha. We start our journey back towards the bigger cities but not without a final blast. 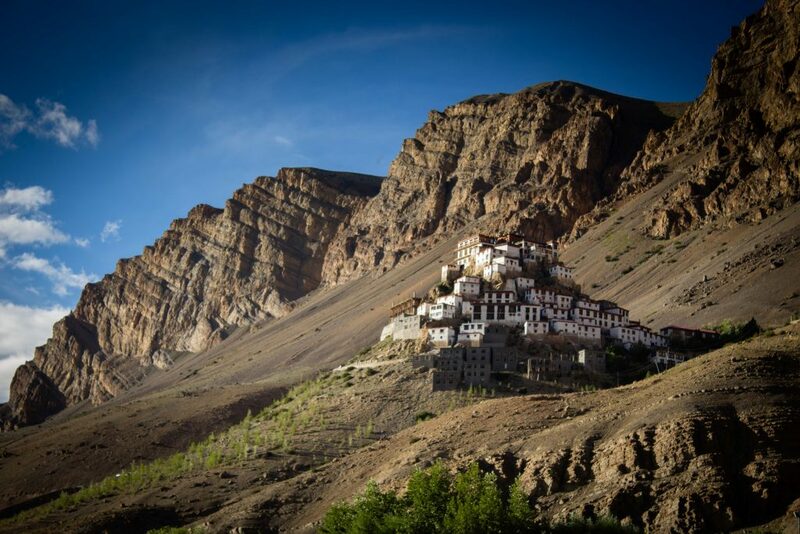 We head to the most famous monastery of Spiti at Kee. Known commonly as the Kee Gompa, the monastery looks like a pyramid of houses, built on top of a hill. Enjoy the tasty cup of tea served by the monks as you walk through the maze of Shrines. From here we drive to the village of Kibber to witness one of the masterpieces of modern construction – Kibber Chicham bridge built up on the gorge at a height of 4300m. Our next destination is the gem hidden in the folds of the Himalayas – Chandratal or the Moon Lake. Situated at 4300m on the banks of the Chandra river is this fresh water lake fed by the snow melt of surrounding hills. Must do at Chandratal is the Parikrama of the lake, a circumambulation trek of 4Kms. As you reach the other side of the lake, a look backwards reveals the most breathtaking beauty that there is, high mountains of ChandraBhaga peaks decorating the background of this lake makes one lose themselves in this myriad beauty. After a fulfilling walk we head back to the campsite to rest and look back at the memories on the last night of this tour. Last day of the trip, for those whose heart yearns for one more sight of Chandratal can go to lake early morning, before the sunlight falls on the lake, to see the surrounding mountains reflect in harmony with the stillness of the lake. After breakfast at the camps we start back to Manali via the Batal – Gramphu road and Manali – Leh Highway. As your minds wander back to the lives that lay ahead we bid goodbye to you at Manali, with the breathtaking visuals of the last week leaving you wanting for more.